If you have read our previous blog posts on photography basics (here, here and here) and you have familiarized yourself with your camera's settings and have all your tech accessories, it's time to start building your portfolio. The easiest way to start building a portfolio is to start shooting free assets like nature, friends and family. Shooting for free is necessary in the beginning as you navigate the many different styles and trials of photography. Friends and family is a great place to start because more than likely they will work with you for free. Try finding photography that you like from magazines and learn who the photographers are and follow them on social media. Use the internet to guide the look and feel of your target clients. After you have started building up a portfolio it’s time to start showing them off. Using the internet can be a powerful tool for marketing yourself to potential clients and brands that might want to work with you. Great website builders like Wix, Squarespace, and Zenfolio have options for consumers and professionals with pricing options for different budgets. Depending on your category of photography setup your website with images that will appeal to your target customer. Do you shoot landscapes? Stack up your main page and galleries with your fav scenic views and breathtaking vistas. Do you want to shoot fashion? Add pictures of models or jewelry in separate galleries so a client can search both. Using social media can be a great way to see what other photographers are doing on their page or site. Now that you have a presence on the web with your stunning pictures its time to do some legwork and meet clients. Photo Groups like “H Collective” might have local meetups in your area and these are great ways to meet other photographers. Working with other photographers is a great way to learn about all sorts of things about the business. Meetups are a great place to meet models and model scouts. Talk about gear and settings, where and when to shoot, but more importantly, get out in the real world and meet people. Clients and work come from everywhere and you should always be ready with a business card so a potential client can go see your website and book you! Some photographers are also teachers and offer training programs in all sorts of categories. Just like networking, collaborating with models or brands is a great way to get your foot in the door with potential paying clients. Sometimes a client wants to “test” or collaborate to get a feel for how you would work with their team. Remember that it is important to be flexible, reliable, and friendly. Photography should be fun and it's your job as a future professional photographer that you are getting the shot, but also making everybody feel as comfortable as possible in front of and behind the camera. Use your networking to set up shoots and build that portfolio up even more. Always take notes after each session to keep tabs on your progression and tips you might learn along the way. Starting out you will probably be doing some free shoots. I recommend shooting for friends and family first, then working to a pay structure that fits your level of service and skill. Most photographers charge an hourly rate or offer packages for there specific kind of photography. Again it's good to look at other photographer websites and see if they list their prices publically. Things to consider are your time, editing, travel, taxes, level of skill and saving for the future. There are many great resources for building your photography business and discuss topics like getting paid, taxes, and insurance. The PPA or Professional Photographers Association is the best resource for all things photography and getting paid in the industry. So you have worked on your photo taking skills and built a portfolio with a website to show off your work. 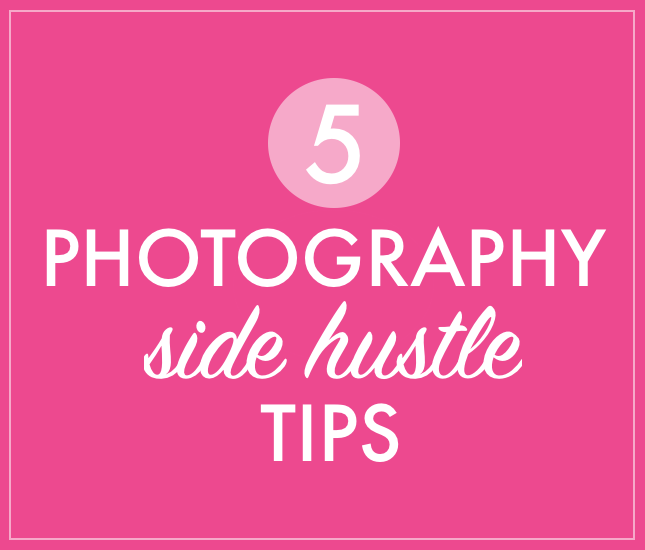 Now, it's time to turn that side passion into a side gig. Remember that it's important to be professional and creative. Photography is a highly competitive business and if you want to succeed, practice makes perfect. Use your network and collaborate to create. Money will come soon enough but you have to get to a level of comfort behind the camera before you can charge for shoots. So do your research, remember to always keep shooting and learning, stay open-minded, and paying clients will start to emerge.